Like most software applications, Map Business Online has a save button that lets you save the business maps you’ve created. Even though Map Business Online almost always starts up displaying the map you last worked on, it’s a good practice to save your map work. Simply click the third button in from the left on the Master Toolbar – the floppy disk icon – and save your work. I would suggest to many users that you consider adding a variation on map saving to your Map Business Online repertoire. Instead of always saving a map in the My Maps folder, consider saving your map as a Template map in the My Templates folder. This option is a simple drop down away from My Maps. Saving your map as a map template requires some thought. You need to remember that you created that template map the next time you make a similar map that can benefit from the template process. That’s the whole point of a template, to avoid senseless duplication of effort. Get in the habit of looking in the template folder before you create a new business map from scratch. If you are building maps for business, your maps may contain several to many map layers that are pertinent to your business. They could contain draw objects, imported data layers, demographic data, drive time polygons, or sales territories. Any one of these layers may add value to maps designed to support aspects of your business. Which means you will use these layers over and over. Map templates allow the map creator to take time building the map infrastructure for a major business map project, and then save it for use in any map you build moving forward. Save your most pertinent layers as a map template. This means the next time you are asked to build a map for a department, you’ve already got a basic structure to work with. Remember, you can always turn off a layer for a particular map. Think of the time you’ll save. Once your template map is saved, simply open the template to start a new map version. What I do is this: open a My Template map and immediately save it under another name in the My Maps folder. I then edit away, creating a new My Map version. Sometimes I forget to save it in the My Maps folder up front. I just save it after a couple of hours of editing. That’s OK. Just try to avoid saving over your existing template. Be careful and methodical in your map saving process. If you’ve imported data into your template map and built a variant saved map from that template, the data will carry into the new map and will stay with the new map, even if you delete your original template map or data layer. Keep in mind, template maps cannot be shared as a publicly shared interactive web-map. You’ll need to save it as a My Map version to access MapShare. You’ll find the Save Map and Open map dialogue includes some additional functions. Within the Save map dialog you can rename a map or delete a map. You will notice that you cannot delete every map – one map, at least, must remain. The Open Map dialogue also includes a filename adjustment option and the delete option. 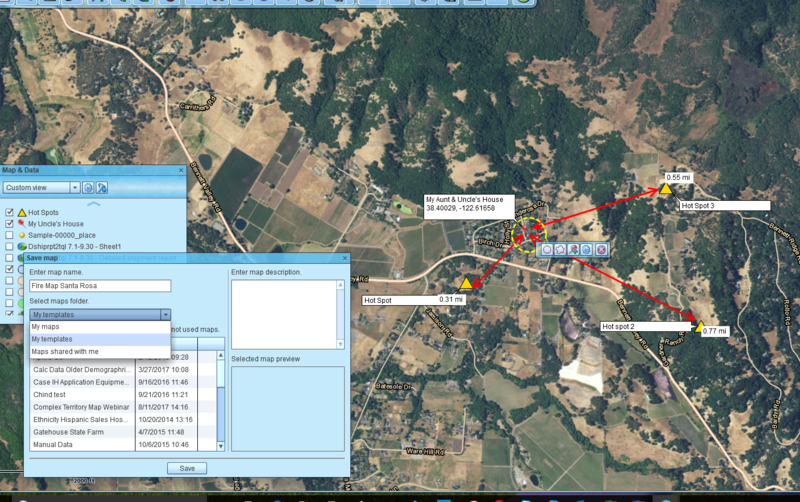 A user can also launch the MapShare wizard from within Open Map. This comes in handy sometimes. The Open Map folder will also display a preview of your map – it’s kind of small, but will help you recognize the map before opening it. ZIP Code Filler Maps – Map Business Online lets the users create maps that fill in areas with no ZIP code. (See previous blog post.) National parks and military installations out west do not have ZIP codes associated with them leaving white spaces on ZIP code maps. By choosing ZIP codes with Fillers in Manage Map & Data a user can take the time to create a ZIP codes base map with fillers. This is a three-hour process. Be sure to save that ZIP codes map as a template so the next time your filled in base-map is ready to rock. Advanced Territory Maps – Businesses with significant and complex territories, such as those including regions and divisions, will be wise to save their baseline territory map as a map template. That base-map template could show the entire territory structure with sales rep home addresses and territory goals and objectives. Each month, a manager or admin simply overlays the previous month’s results. Perhaps a new map is created only once a year as the new sales plan is developed? You decide. The Boss’s Favorite Map – We all know how it is. The boss wants his map a certain way. Maybe she prefers a satellite background, with key map objects drawn in, and only the county map layer turned on. Regardless of how your boss prefers the map, save a version as a template to make things easier on yourself next time. Map templates save you time and that means your next map will tend to be more accurate. If you truly love your maps you’ll save them and use some of them as map templates.